For a cheap ferry to Bilbao why not travel with P&O Ferries from Portsmouth for the ultimate ferry journey. With P&O ferries you get superb onboard facilities plus great entertainment.P&O Ferries depart from Portsmouth every three days for most of the year and offer the most convenient cruise style crossings to Spain for car and passenger. 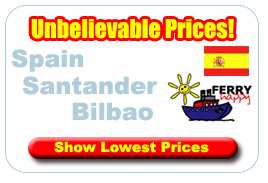 Or instead of taking the Ferry to Bilbao why not travel from Plymouth to Santander with Britanny Ferries? Sailing to Bilbao with P&O Ferries is so easy - whether you're camping with your family, surfing with your mates, skiing in the Pyrenees or staying at your holiday home, you can pack as much as you can fit in your car! Our overnight cruise style crossings mean you can enjoy a whole lot more leg room than other modes of transport! The sights can be rather more interesting too - you'll enjoy exhilarating sea views and fresh air as you stroll on deck. Portsmouth a significant naval port for centuries and still the base for Nelsons HMS Victory remains the dockyard for the Royal Navy.As well as HMS Victory Portsmouth port is also home to many other famous ships. Portsmouth is the second busiest port in the UK, each year 3.5 million people travel from Portsmouth to Continental Europe. It has excellent road links from London via the M3 and A3. Whilst it may not have the quickest journey times to France and Spain, it gives the passenger a more relaxing enjoyable journey so traveling by Ferry to Bilbao can be agreat experience in its own right!. Travelling to Spain by sea is easy with P&O Ferries docking at the beautiful port of Bilbao in the Basque Country of Southern Spain.Why not book your cheap Ferry to Spain online today.If you'd like to travel to Spain by Ferry from the UK you have two routes and three operators to choose from which are listed below. P&O Ferries operate a Portsmouth to Bilbao service every 3 days during peak season. The journey time on the luxurious 'Pride of Bilbao' is between 29 and 35 hours depending on conditions. Very popular service with mini cruisers. Prices include accommodation. AT Ferries (Acciono Trasmediterranea) is a major Spanish ferry company offering services between Portsmouth and Bilbao on their superferry, the 'Fortuny'. It has a 1000 passenger capacity and can accommodate upto 330 cars, caravans and coaches. Very comfortable crossing with excellent onboard facilities.